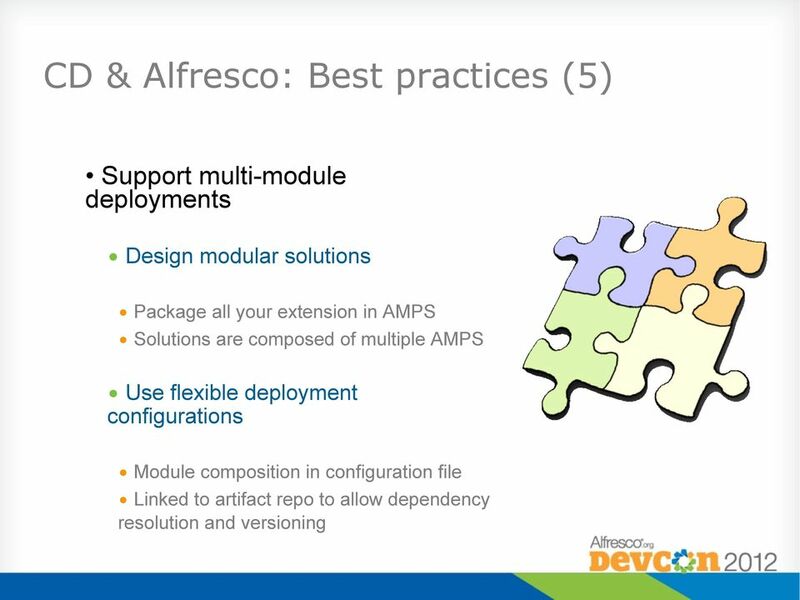 Download "Continuous Delivery for Alfresco Solutions. Satisfied customers and happy developers with!! 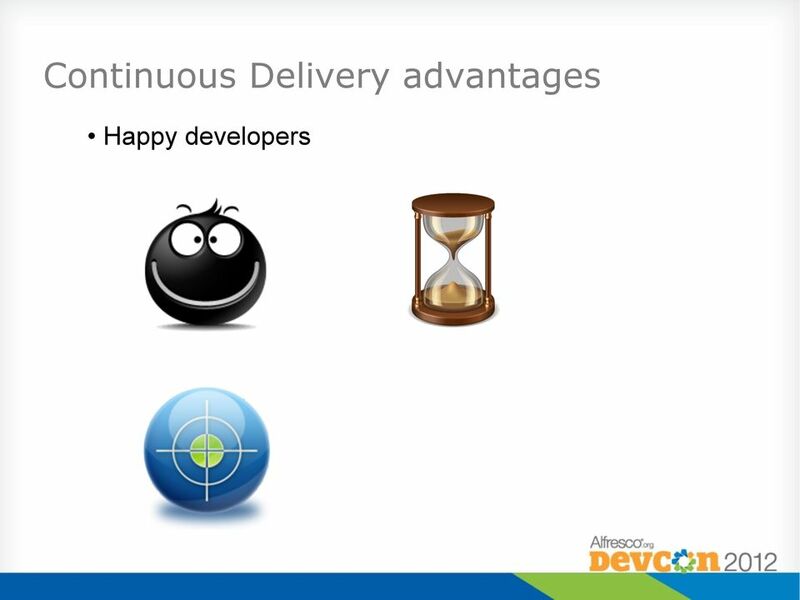 Continuous Delivery!" 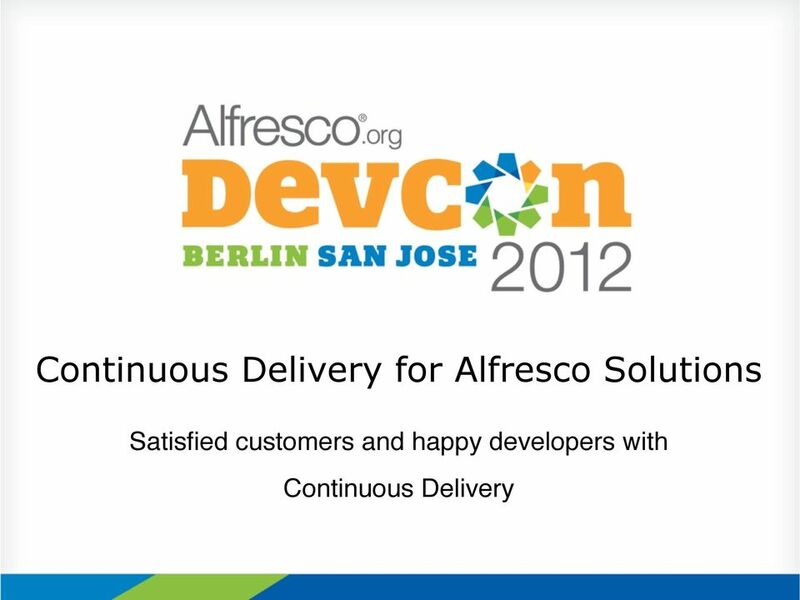 1 Continuous Delivery for Alfresco Solutions Satisfied customers and happy developers with!! 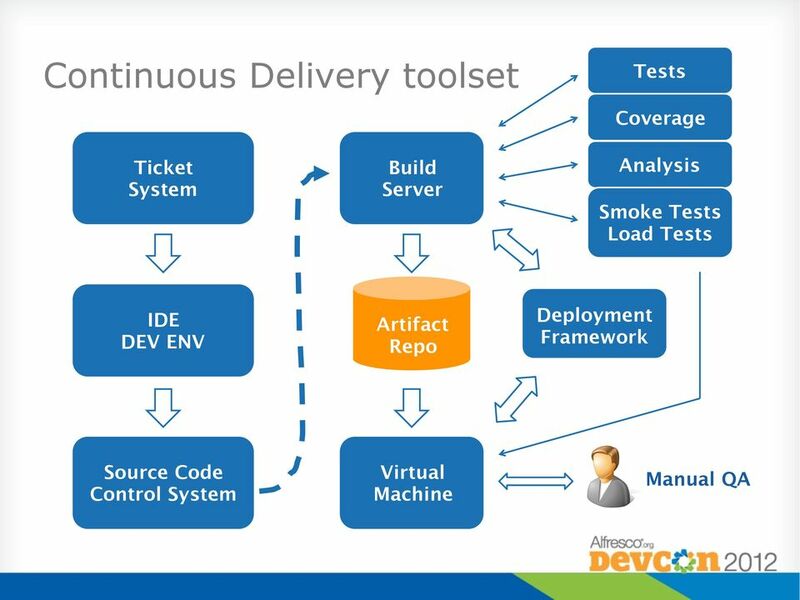 Continuous Delivery! 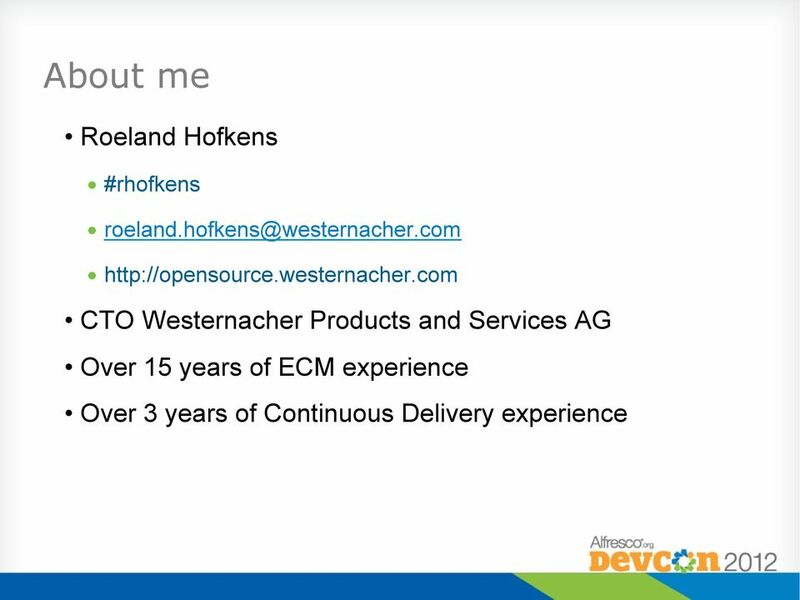 2 About me Roeland Hofkens #rhofkens CTO Westernacher Products and Services AG Over 15 years of ECM experience Over 3 years of Continuous Delivery experience! 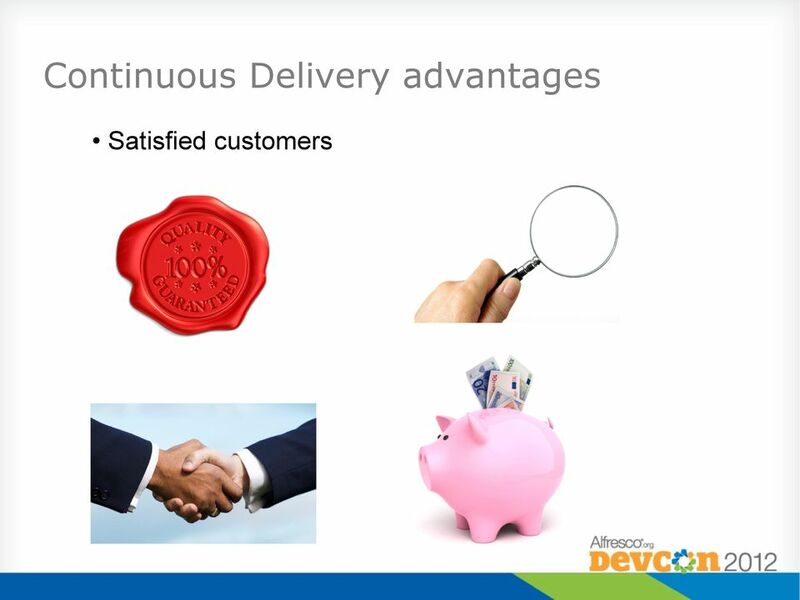 3 Introduction Embrace Continuous Delivery for: Satisfied customers!!! Happy developers! 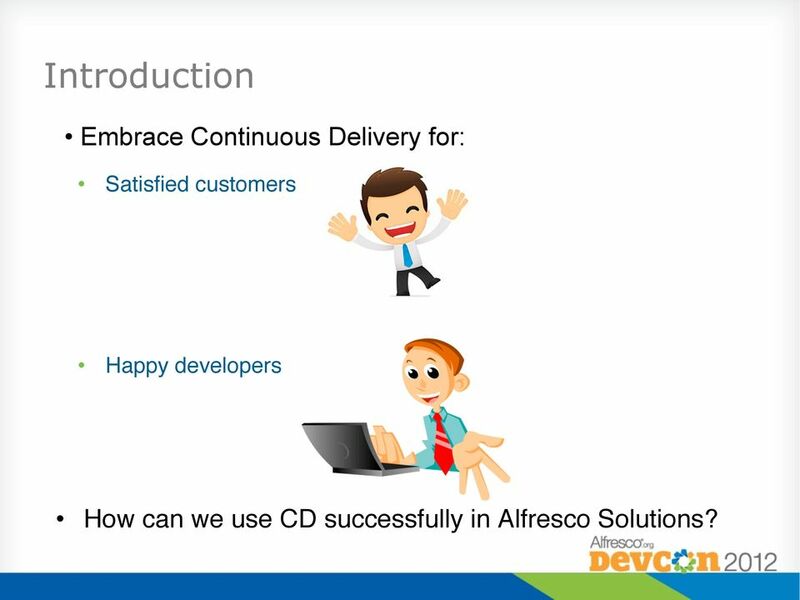 How can we use CD successfully in Alfresco Solutions?! 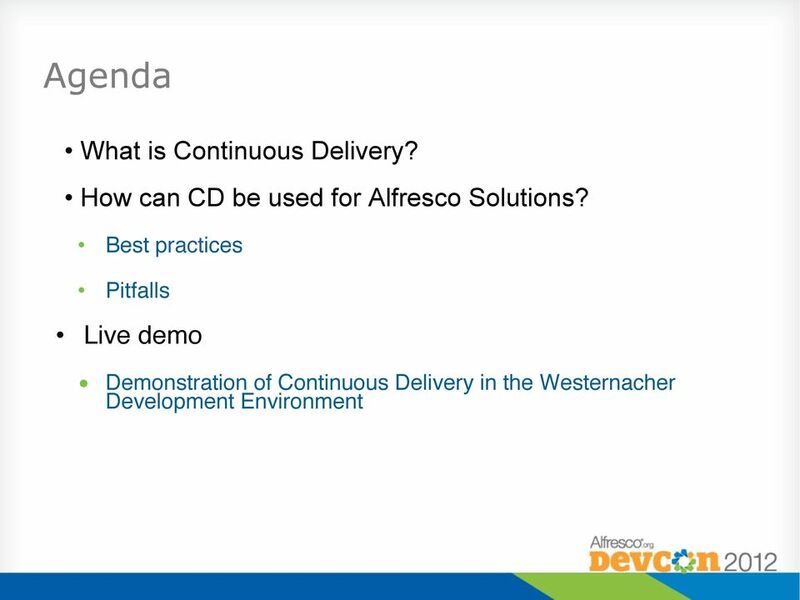 4 Agenda What is Continuous Delivery? 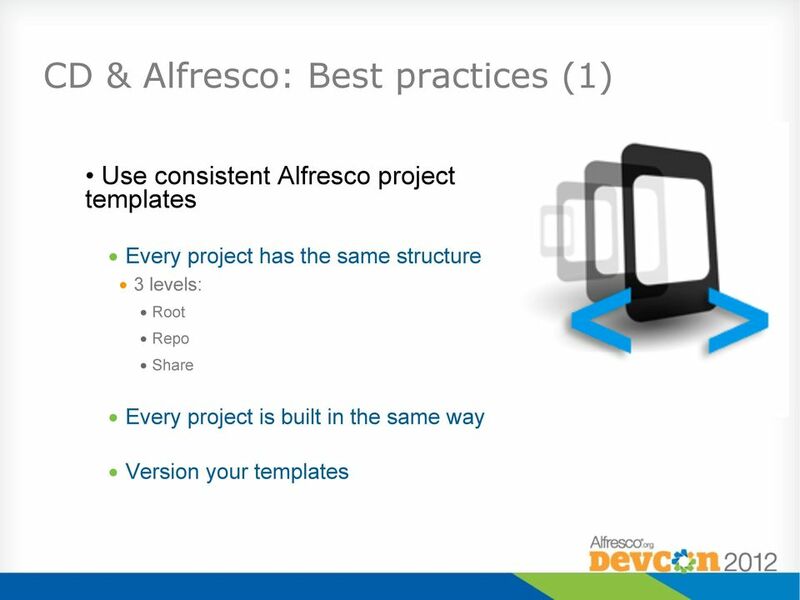 How can CD be used for Alfresco Solutions? 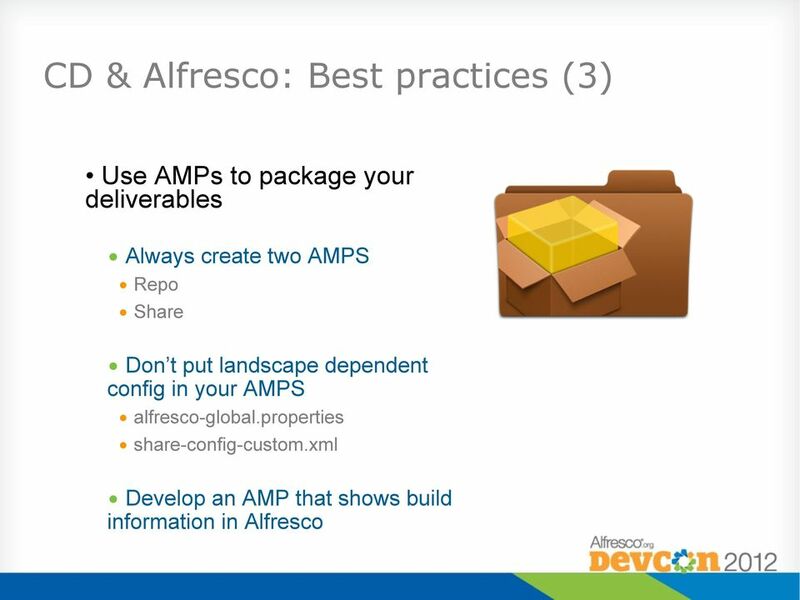 Best practices! Pitfalls! Live demo! 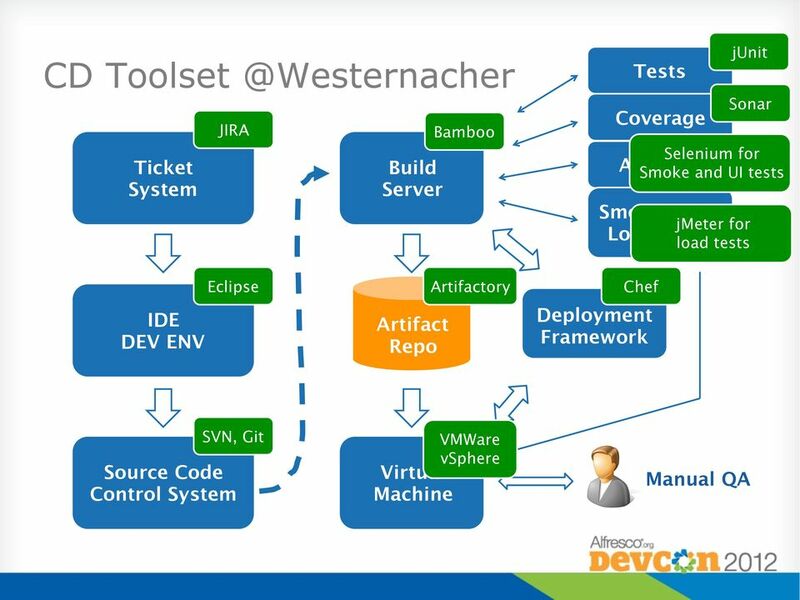 Demonstration of Continuous Delivery in the Westernacher Development Environment! 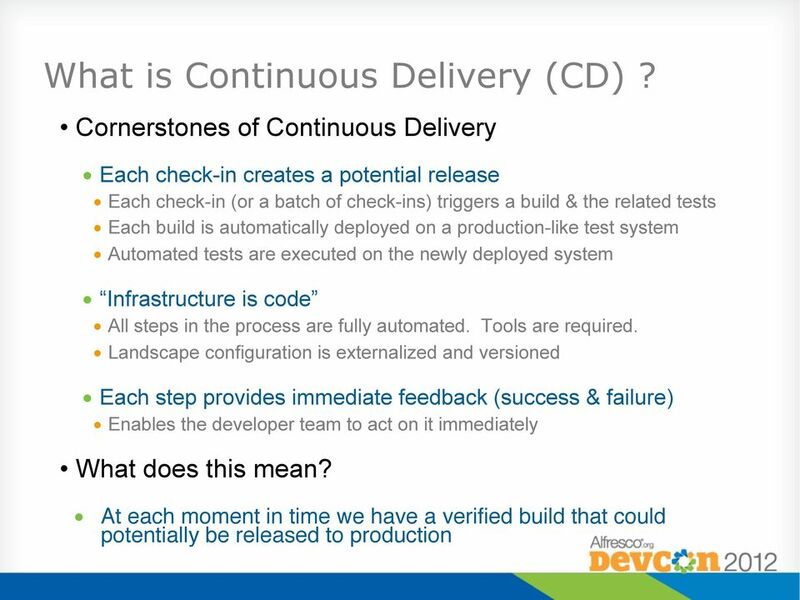 5 What is Continuous Delivery (CD)? 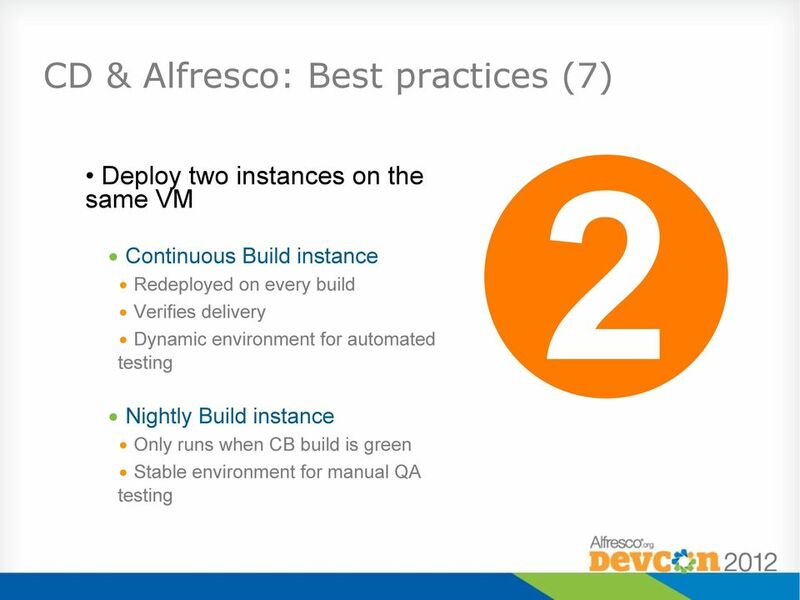 Cornerstones of Continuous Delivery Each check-in creates a potential release Each check-in (or a batch of check-ins) triggers a build & the related tests Each build is automatically deployed on a production-like test system Automated tests are executed on the newly deployed system Infrastructure is code All steps in the process are fully automated. Tools are required. 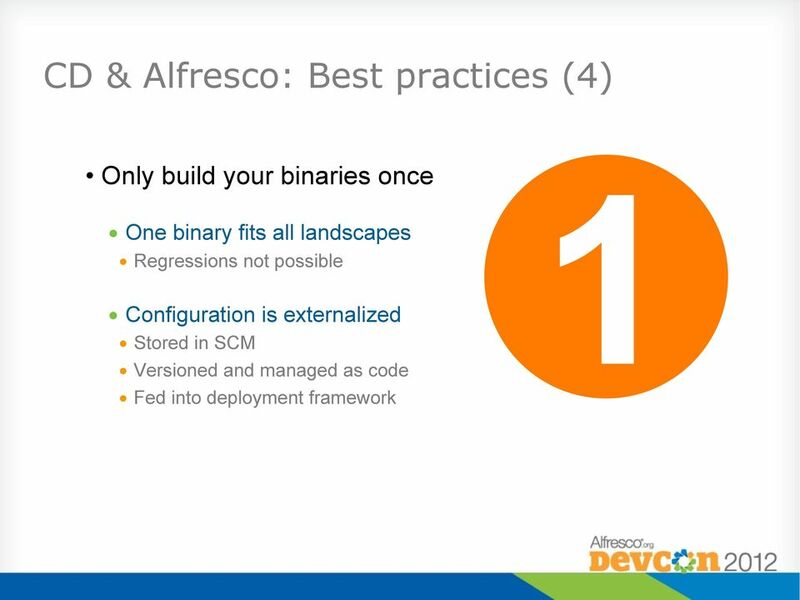 Landscape configuration is externalized and versioned Each step provides immediate feedback (success & failure) Enables the developer team to act on it immediately What does this mean?! At each moment in time we have a verified build that could potentially be released to production! 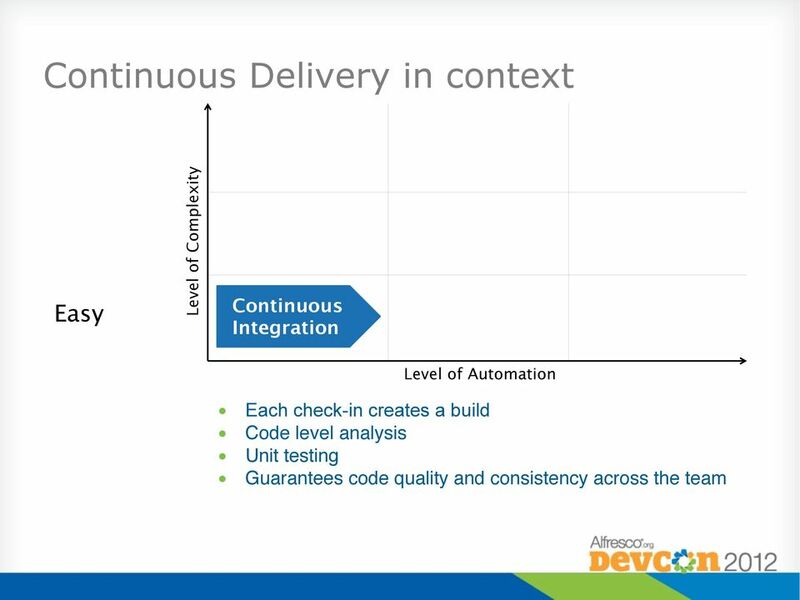 6 Continuous Delivery in context Easy Level of Complexity Continuous Integration Level of Automation Each check-in creates a build! Code level analysis! Unit testing! Guarantees code quality and consistency across the team! 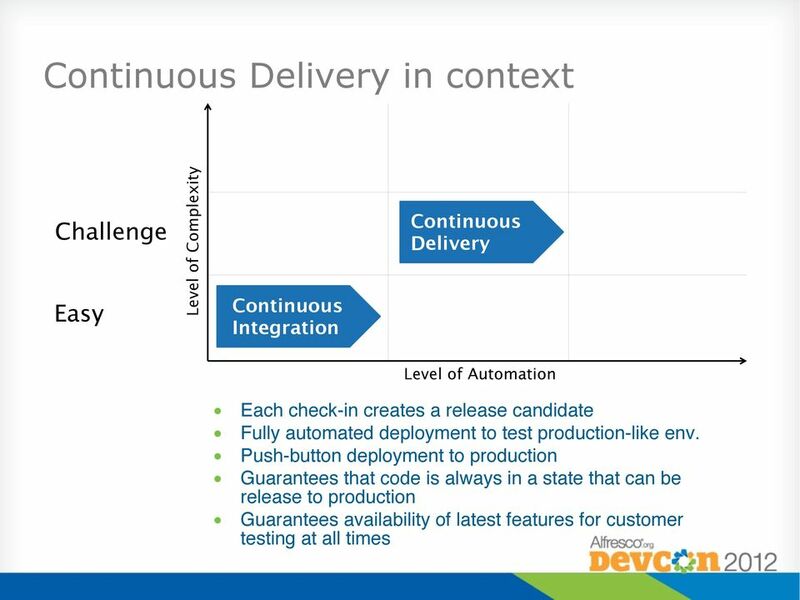 7 Continuous Delivery in context Challenge Easy Level of Complexity Continuous Integration Continuous Delivery Level of Automation Each check-in creates a release candidate! Fully automated deployment to test production-like env.! Push-button deployment to production! 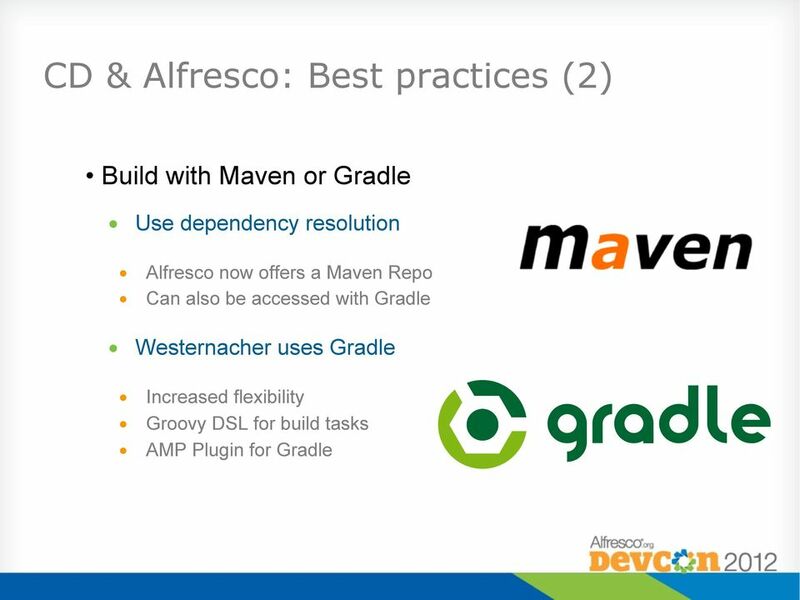 Guarantees that code is always in a state that can be release to production! Guarantees availability of latest features for customer testing at all times! 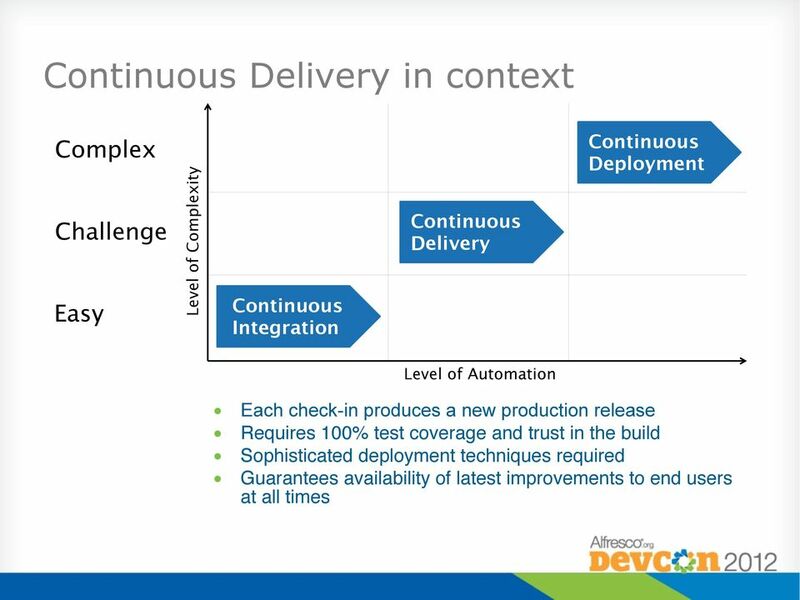 8 Continuous Delivery in context Complex Challenge Easy Level of Complexity Continuous Integration Continuous Delivery Continuous Deployment Level of Automation Each check-in produces a new production release! Requires 100% test coverage and trust in the build! Sophisticated deployment techniques required! Guarantees availability of latest improvements to end users at all times! 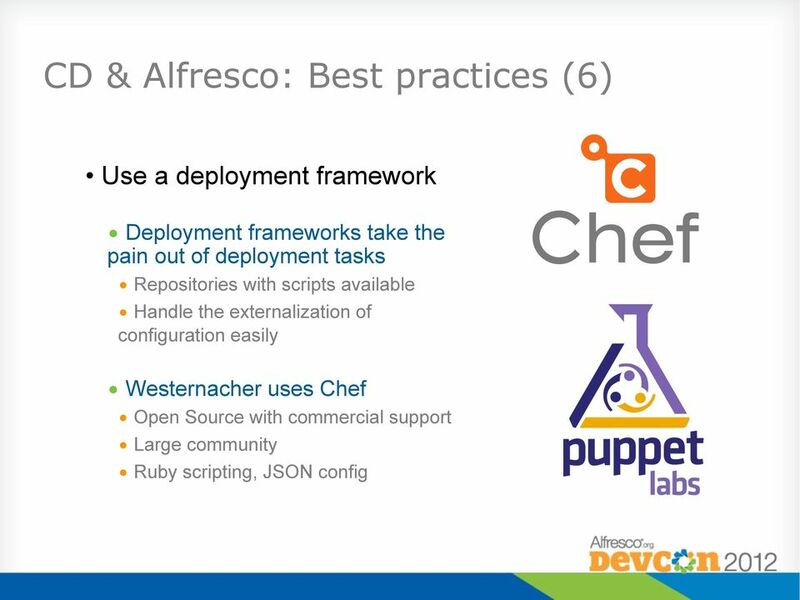 Collaborative DevOps Learn the magic of Continuous Delivery. Saurabh Agarwal Product Engineering, DevOps Solutions agarwasa@us.ibm. 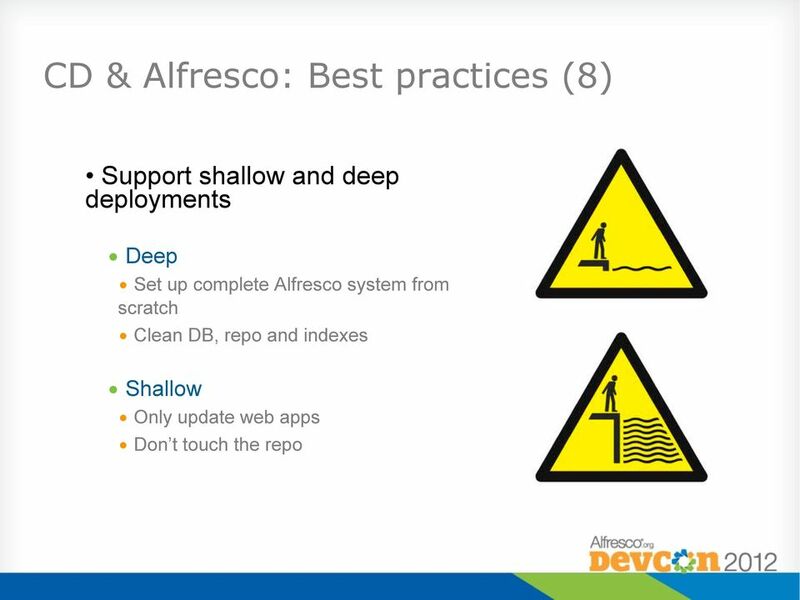 Demystifying DevOps. - Uday Kumar.